Explore in the interactive world of Arduino with Jameco's stock of the Getting Started with Arduino Kit. The Getting Started with Arduino Kit is your starting point into the world of physical computing. Using the electronic parts included, you'll be ready to join the tens of thousands of engineers, designers, artists & hobbyists who have discovered this incredible and educational prototyping platform. 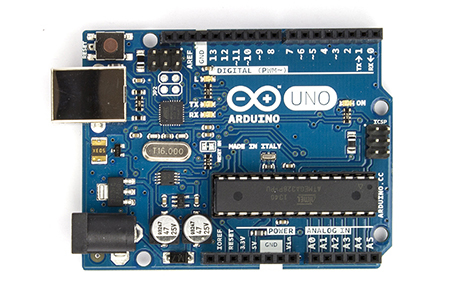 The Arduino Uno is a microcontroller board based on the ATmega328 (datasheet). It has 14 digital input/output pins (of which 6 can be used as PWM outputs), 6 analog inputs, a 16 MHz crystal oscillator, a USB connection, a power jack, an ICSP header, and a reset button. It contains everything needed to support the microcontroller; simply connect it to a computer with a USB cable or power it with a AC-to-DC adapter or battery to get started. The Arduino Uno SMD Edition (R3) is also available.